Thinking or thoughts take up a massive part of our lives, if you think about it when was the last time you didn’t think about something? It’s almost impossible not to think isn’t it? I guess you could say that I was always a glass half full kind of girl. I believe that the way those around you think has a huge impact on your own thought process, especially when your young. From a young age I always thought of the worst case scenario. That I had bad luck, I just wasn’t lucky enough, nothing ever went my way. That’s just how life is……. you get the point. Taking those thoughts and feelings into adulthood did me no favours whatsoever. Negative thoughts pushed me in wrong directions. I missed many opportunities because I just did not have the confidence. I feared failure and rejection before trying. Such thoughts made me feel quite angry to some extent. I felt resentment towards others, particularly those who seemed to be doing well. Those who were ‘lucky’, always landing on their feet. I often felt jealous of those who had confidence or appeared financially secure. When I look back now I was a miserable cow really, if I’m totally honest with myself. Fast forward a decade and I’m thankful to say that those thoughts are behind me now. I have worked hard to push them into the delete section of my mind. My major turning point was when I was diagnosed with depression. My diagnosis gave me a lot of the answers I had been searching for and was a huge turning point for me. I went and had therapy to find ways of controlling my negative thoughts. To stop unhelpful thoughts in their tracks and switch my thought process to a more useful thought. I would highly recommend this type of therapy to anyone who suffers from depression and/or someone who gets bogged down by negativity. It helped me weed out some of the bad roots. Providing me with a starting point to look to the future. Another major turning point for me was when a relative lent me a book about the law of attraction (that in itself is a whole other post). For those of you who have never heard of the law of attraction, it’s a theory based on the fact that like attracts like. So if you have a negative thought you will attract negativity, and if you have positive thoughts, you will attract positivity. That really is a basic explanation, there is so much more involved than that but you get my drift. The book changed my life. I saw in an instant that my outlook and thought process had seriously held me back over the years. That’s when I started focusing on small things a first, for instance issues that niggled at me. I would find a way of flipping the negative thought on its head and come out with a positive. Where I might once get cross at being late for something, I decided to go with the flow. What if I was late for a reason ? This handy printable lets you keep track of your thoughts and feelings throughout the week. With space to note down negative thoughts as well as positive reflections. Powerful quotes and positive affirmations help you face the day ahead. See the Gardening Love Shop for more details. Following this new line of thinking has made me a much happier person. I still have depression, I just manage it differently now. I have tools I can use to get out of dark holes and ways to stop self sabotage and unhelpful thoughts dead. This new way of positive thinking has helped me improve some of the relationships in my life, I see things differently, I try to think outside of the box. Thinking and thoughts are a part of our life. They control our emotions, our reactions and impact the decisions we make daily. The power of thought is massive. 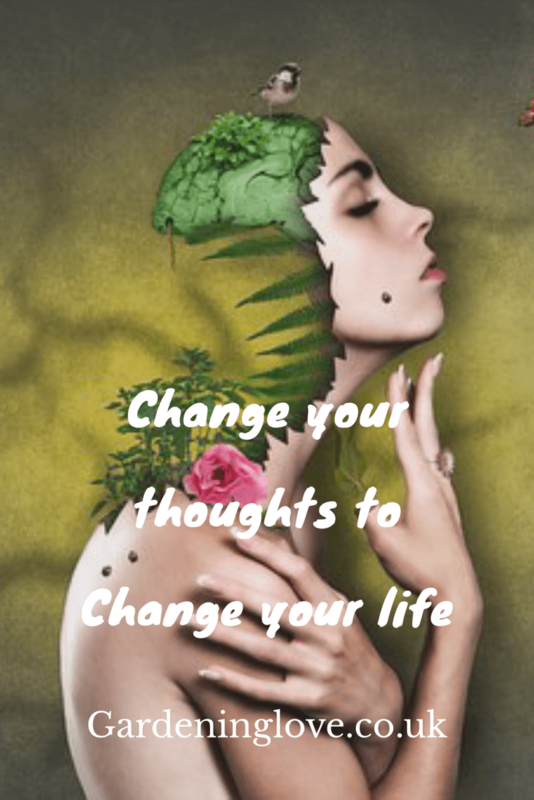 Changing the way you think can change your whole life. What are your thoughts? Do you believe in positive thinking? Please comment and share. How to beat the winter blues by following these tips. It sure is ! Here’s to a positive future. Thank,you for taking the time to read. Isn’t it crazy how much we could accomplish with the right mindset? Thanks for a great article! I’m glad the post helped you. Good luck for the future. Thank you for sharing your struggles. So many have the same ones and are afraid to share them. Depression is a disease just like any other. Glad you are doing better. A positive attitude makes a big difference. This is such a great post at a really timely point in my life. Thanks so much. I’ve been in a funk and I need to consciously get myself out! I love this post! Positive thinking is such a game changer!